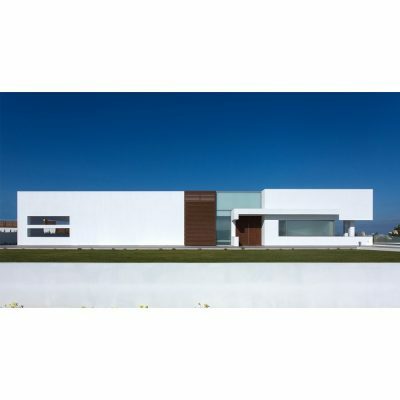 The initial intention was to create a building volume facing towards the sole visual connection to the sea, with a constant dialogue between the external element and the residence. The design aimed for a spatial organization of the building through close contact with nature, as well as the use of the local climate. The volumetric voids, in combination with the element of transparency, attempt to alleviate the distinction between exterior and interior in order for the landscape to become part of the living area. The design aimed for a spatial organization of the building through close contact with nature, as well as the use of the local climate. Τhe element of transparency, attempts to alleviate the distinction between exterior and interior in order for the landscape to become part of the living area. Large openings allow natural light to penetrate the interior, adding thermal efficiency during the winter period. Shading surfaces are used as filters that control sun flow in the living zone, and offer protection from western light during the summer. At the joint of the two volumes, an open atrium is created as a point of reference, achieving better lighting and ventilation of the adjoining living areas, as well as the sense that nature intervenes in the interior, since from every corner the occupier may focus on the views.The implementation of bioclimatic elements, the use of thermal insulation, the geothermal energy and other building elements, as well as the orientation, add to the reduction of the residence’s energy load. The synthesis is characterized by austere lines and geometric clarity. 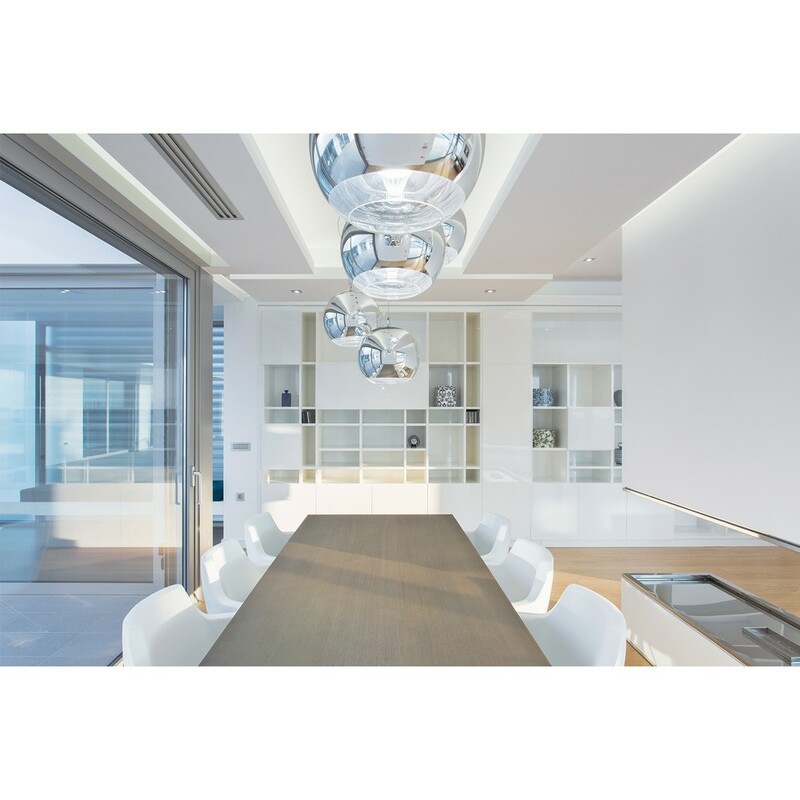 The color white predominates and in combination with contemporary materials, it highlights formal structures and the simplicity of the design. The implementation of bioclimatic elements such as the atrium, the shading, the use of thermal insulation, the geothermal energy and other building elements, as well as the orientation, add to the reduction of the residence’s energy load. The residence, situated below the mountain ridge borders, is facing towards the sole visual connection to the sea. Seeking a constant dialogue between the external element and dwelling, it forms to an L-shape, with its external sides austere and closed, in order to protect privacy within, while the internal corner contains the everyday living. The building comprises of two volumes with the former and longest, which contains living areas, placed almost parallel to the north-south axis, in contact with the court and the swimming pool, while the bedrooms face towards the south and the auxiliary spaces to the north. 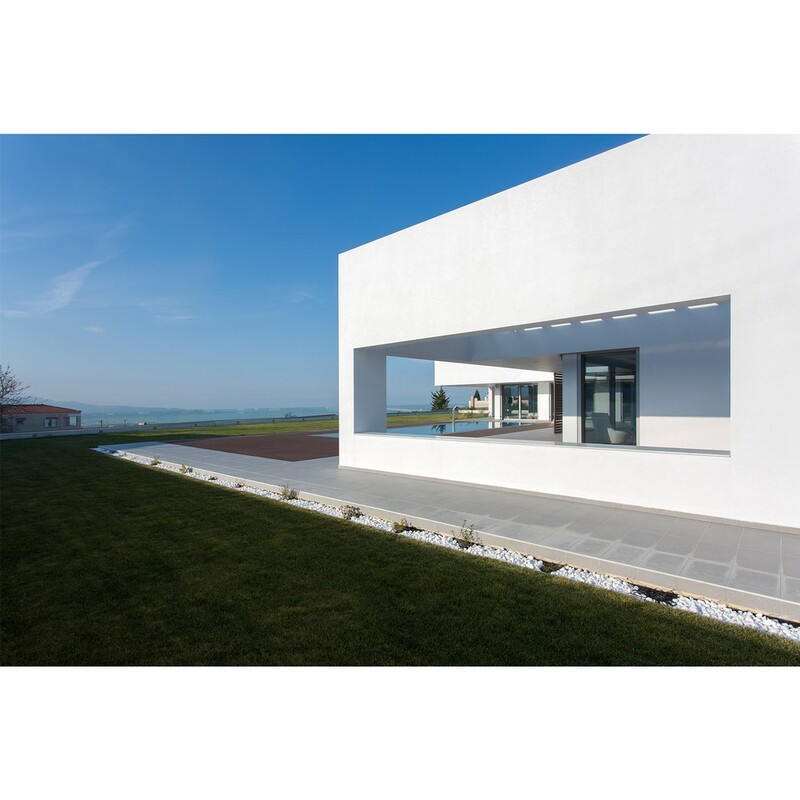 Τhe element of transparency, attempts to alleviate the distinction between exterior and interior in order for the landscape to become part of the living area. Large openings allow natural light to penetrate the interior, adding thermal efficiency during the winter period. Shading surfaces are used as filters that control sun flow in the living zone, and offer protection from western light during the summer. At the joint of the two volumes, an open atrium is created as a point of reference, achieving better lighting and ventilation of the adjoining living areas, as well as the sense that nature intervenes in the interior, since from every corner the occupier may focus on the views. The implementation of bioclimatic elements, the use of thermal insulation, the geothermal energy and other building elements, as well as the orientation, add to the reduction of the residence’s energy load. The synthesis is characterized by austere lines and geometric clarity. The color white predominates and in combination with contemporary materials, it highlights formal structures and the simplicity of the design. 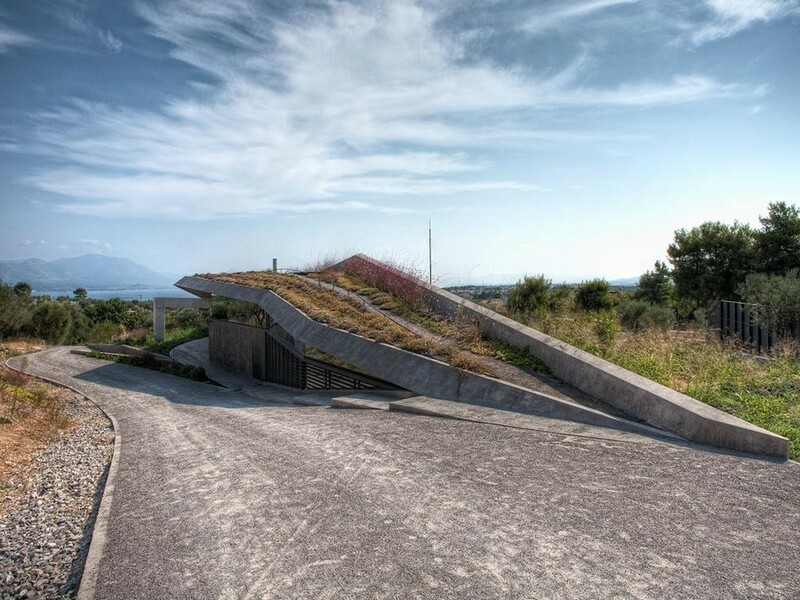 The residence is situated below the mountain ridge borders, on a site with limited views to the sea in the northwest, and with neighboring buildings blocking the south and part of the north. The research challenge was to create a building volume facing towards the sole visual connection to the sea, with a constant dialogue of the residence with the nature element. 3+ architecture is an architectural firm mainly engaged in architectural design, interior and commercial design. Fundamental objective of each study subject, beyond programmatic, environmental, or it’s humanistic dimension, constitutes the creation of spaces or buildings with dominant schematic structures that would incorporate the habitation needs, and can be characterized by functionality and quality, so that the user enjoys the space-building, and his coexistence with the landscape. 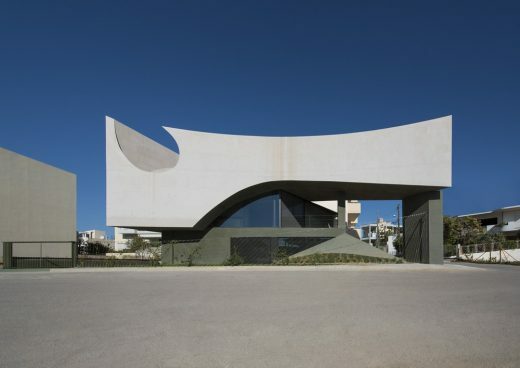 Residence in Crete Private House by Anna Garefalaki-3+architecture is Winner in Architecture, Building and Structure Design Category, 2017 – 2018.